The Nycan Cat quilt begins! In my last post I showed you what my grandson and I are working on. 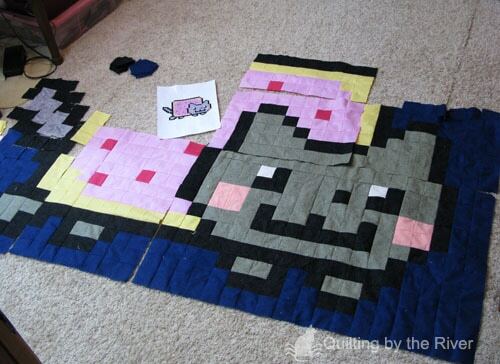 If you guessed I was making a Nyan Cat quilt you were right. Would you believe that before last night I had never heard of a Nyan Cat! 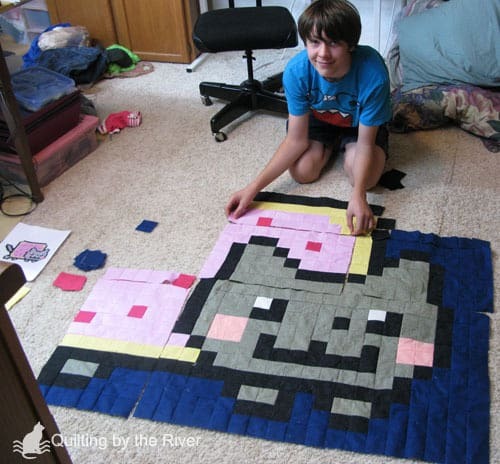 When Xander showed me the pixel art I figured no big deal this will make a cute mug rug………what was I thinking! I’m using 2.5 inch squares and it just keeps growing! Here you can see Xander helping me lay it out……………..
and here is what he is usually doing…………. The first photo is how far I we are today. Unfortunately “someone” wasn’t paying attention and I added the dark blue squares around the tail……….now I find out “we” have to add a rainbow. Now that Xander has been showing me all the Nyan Cat stuff I can’t believe how popular it is. I guess I am showing my age as graphics like this were what computer games were like in the “old” days. 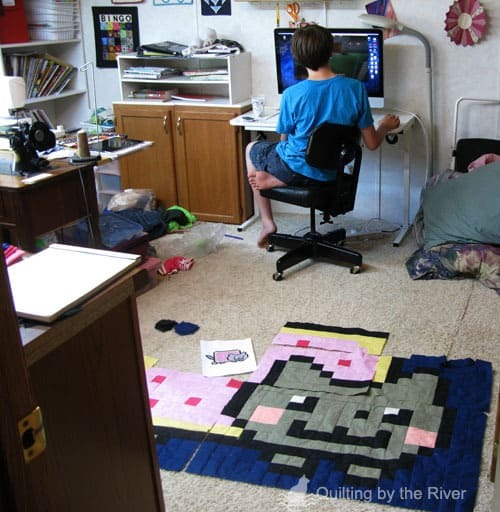 His favorite game right now is Minecraft which has graphics like this………yuck. I love the graphics in games like World of Warcraft……yes I admit I like computer games. I have no idea how big this is going to be but I’m going to work like crazy to finish it as I just got word that “they” aren’t leaving until it is done. Talk about incentive!! Tomorrow morning I have to go help Builder Bob finish the small deck and guess what? He has a injury too! To be continued……..
More posts on that crazy Nyan Cat! This quilt looks amazing already! Love it! Wow – that is such a cool quilt! Great idea and how fun to have a partner! Haha! I totally laughed out loud! You are the BEST grandma!!! Oh my more power to you working with all those 2.5" squares. Well at least you get to spend time together right?! What a cool idea! Trying to figure out if I should show this to my sons or not. I may never get out of my studio if I do! How much fun you are having! And I love Xander's comment. Can't wait to see the finished quilt next week. Enjoy! Hi Connie, What a good Grandmother,Xander looks happy with helping (a little)working out the quilt with you.It is looking great.He is cute writing on your blog. I have to admit also I like the games. Minecraft is on my pc as 3 of my boys live around the corner and I love WOW My game at the moment is Alice Madness. haha I will have my 8 Grandies nxt 2 weeks as its school hols. (not all at once I hope) Injured workers!! I never heard of this cat either!! But the quilt top is looking amazing!! Such a great pattern to use!! Love it!! Ah, every little boy should have such a grandma! Who the heck is Nyan cat? It's looking really cute! And what a smile on your helper's face. What a great project to work on together! I've never heard of a Nyan cat either but it looks very cute! I have never heard of this. Gonna go see what Mr. Google has to tell me. Have fun with the kidlets while you can… they grow so fast and pretty soon it will be "all things girl" and grandma and her Nyan quilts won't stand a chance. Have fun tomorrow… be careful! Oh… look at this: Xander is writing on your blog! Cute! This is so wonderful for you to be able to show your grandson all that goes into your creations – And he will always have those great memories! (I'm not showing my kids though or they will want one tomorrow!!!) Looks great! 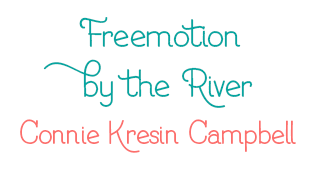 This is very clever—–going to be a great little quilt. 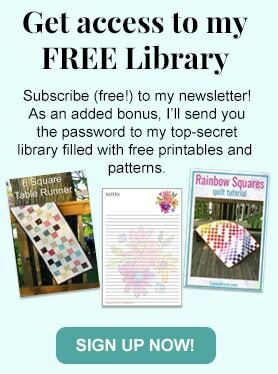 Good quilting lesson for Xander, your can make any design you want with fabric. Helps if you design is made with squares. You are such a fibber! You tell me too go the computer , so I don't talk too you while you are busy. Love you for making me this wonderful blanket! The quilt looks great but I have never heard of this cat before. So I get the impression that Xander is the desinger only and not the stitcher?! I've never heard of it either! What great memories you are making with your grandson! You are the coolest grandmother a boy could have…such a neat project! Nyan cat is shaping out well! I love your little assistant! He is keeping you company – right? It will be a great memory for your grandson I am sure! This is new to me, too. Hey you tore him away from the computer for a little while. Hahaha this is awesome!! !… I love Nyan Cat. Good job, Grandma. I guess I am really out of the loop on these characters. It looks adorable Connie….and add me to those that have never heard of this cat!! When you're done, please post the photo to http://www.facebook.com/nyancatworld . It looks really good and deserves to be there!